These are typically characterized by a slowly expanding lesion, which has a rolled edge with dilated vessels on the surface and a central ulcerated crater. They may bleed if scratched or disturbed. 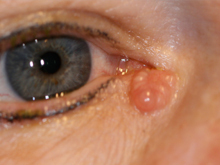 There are variations of these lesions, which are flatter and more diffuse. 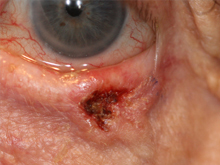 Basal cell carcinomas do not spread to other areas of the body (metastasize), but they will continue to grow and can cause damage to important structures such as the tear drainage apparatus, leading to a watery eye. They may burrow behind the eye causing major sight-threatening problems if neglected.